BEATLES CONCERT TICKET COLLECTINGCollecting USA Beatles Concert Tickets during the past few years has taken off. Beatles tickets are continuing their climb in value based on scarcity, high demand & especially true for near mint to mint condition unused examples of certain shows. Investments in these tickets range from a few hundred dollars to several hundred dollars. Some auction houses have even sold Beatles mint complete unused tickets in the thousands of dollars. It is difficult to find full tickets from any of the Beatles 1964 or 1965 shows as most of those concerts were completely sold out. In 1966 amid controversy, the Beatles played huge sports arenas for the most part & although they were successful, not all sold out leaving full tickets for Beatles collectors to enjoy decades later in their unused glory. The Beatles sold more than one million tickets for their live USA appearances. Most Beatles tickets are priced & evaluated separately & as with all collectibles condition is very important. Folds, stains, tears & any writing reduces the value & usually lowers the desirability of any ticket. Stubs are worth a fraction of the value of the same full ticket, but even that varies depending on the remaining portion & what information or pictures can be seen. Beatles Concert Tickets unlike massed produced commercial products were only available regionally & in most cases are somewhat difficult to find. The printing of the tickets themselves was a fairly complex process that sometimes required many passes through various printing presses. Ticket manufacturers like Globe used to require at least 2 weeks to complete a print job. If the promoter were presenting more than one show by the Beatles another batch of tickets would be printed in the same way but with a different date or time & some form of distinct marking to assist in recognizing it as a ticket for the other performance. There are no known complete Beatles ticket sets in collectors hands even if you count stubs! With over 500 different ticket variations issued in the USA even the most advanced collectors have barely put a dent into having them all. Some have focused on collecting just one ticket or stub per show cutting the required variations to 73. Others concentrate on certain years or venues. Ticket collecting & demand will continue to grow especially while it is still possible to find some nice mint unused tickets. There are still several cities in which no known full unused tickets have turned up although the list is shrinking as several previously undiscovered tickets turned up in the late 1990s. Promoters of these Beatles Concerts had held onto unsold tickets & in the 1990s offered them for sale. * TWO LOAs ~ LETTERS OF AUTHENTICITY#1 Gerald Robert's Validation Statement. Gerry produced the Beatles Suffolk Down Concert with his partner Frank Connelly. This letter contains Gerry's letter head with business address etc., five typed paragraphs, dated & signed. #2 Harold Bloom's Validation Statement. Harry was the Box Office Treasurer who was in charge of the ticket operation. This letter contains Harry's letter head with business address etc., three hand written paragraphs, dated & signed. SUFFOLK DOWNS 1966 CONCERT TICKET INFORMATIONUnused tickets for this show exists due to the fact that Suffolk Downs is a horse racetrack & large portions on either side of the 25,000 center seating area were cordoned off & not intended to be sold. The printer however, made tickets for all of the seats. This is an unusual case where there were a large quantity of full tickets available from a 'SOLD OUT' show. In 1984 a box of these tickets were discovered in Gerald Robert's (Beatles Concert Producer) attic in his Massachusetts home which was in the process of being sold. The Beatles Suffolk Downs 1966 Tickets on this post are part of our personal Cool Collectibles Collection & can be purchased in our eBay Store. 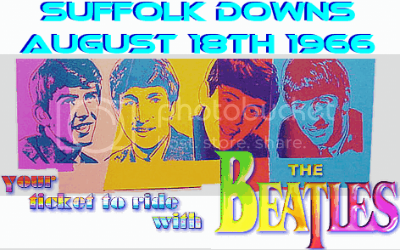 For more information & PICs on The Beatles Suffolf Downs 1966 Tickets & other COOL BEATLES COLLECTIBLES click above. FAB POST AND FAB MUSIC! My cup of tea Lyndy, miss you on MySpace. Come say Hi. Out of about 1,710,000 results on Google for Beatles Concert Ticket Collecting your incredible blog post ranks #3. NUMBER THREE, how excited are you? I would be so happy. You worked hard Lyndy & I congratulate you for you wonderful posts filled with super photos & our favorite Beatles music. Thanks for the thumbs up Jessie & Allen. Yep, I try hard to please. But I think my greatest Google Stats was last months Marilyn Monroe Calendar History. Out of about 9,700,000 results, I rank NUMBER ONE!!! Hey Lyndy, have you ever thought of adding a shopping cart or a PayPal type secure checkout for your Cool Collectibles on this blog?